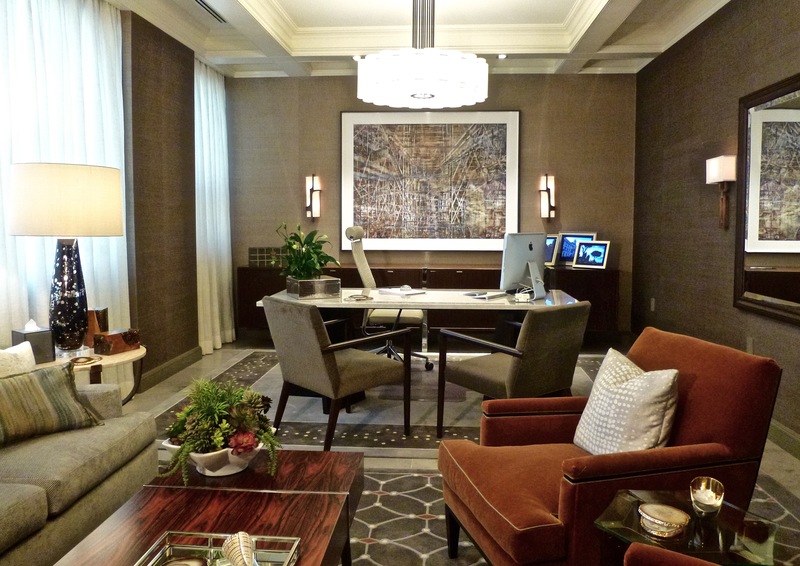 A pair of custom designed rugs, installed over a new light grey stone tile floor, define the desk and seating areas in this executive office. A natural sisal wallcovering was applied on all walls. 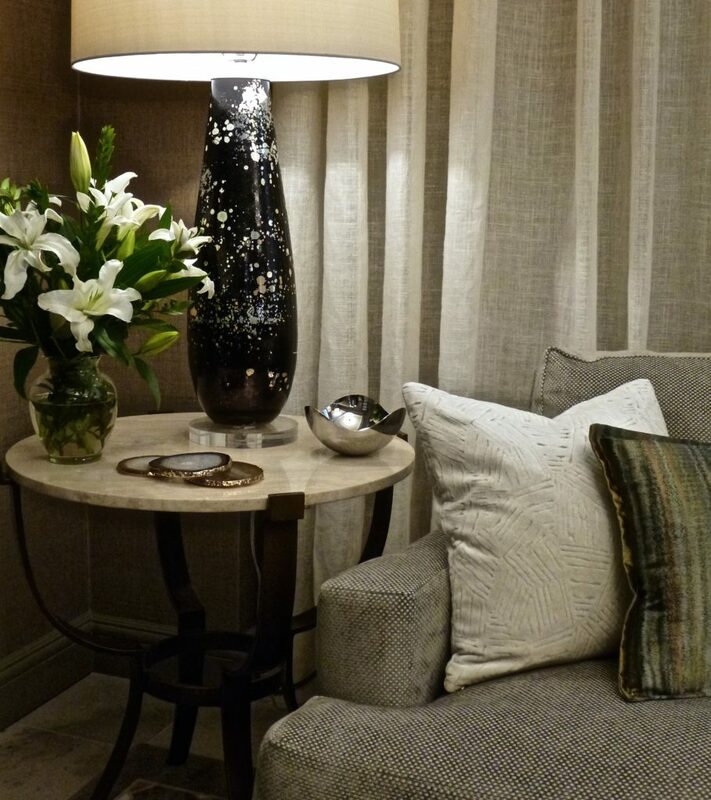 A floor to ceiling sheer linen drapery covers the window wall. 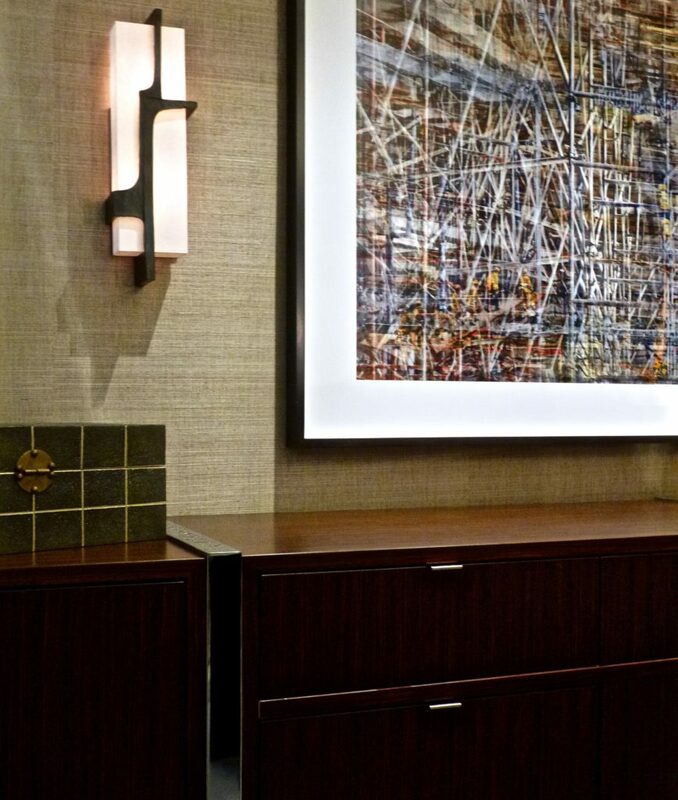 A large contemporary photographic artwork by Shai Kremer is hung between a pair of large sculpted bronze sconces on the far wall. 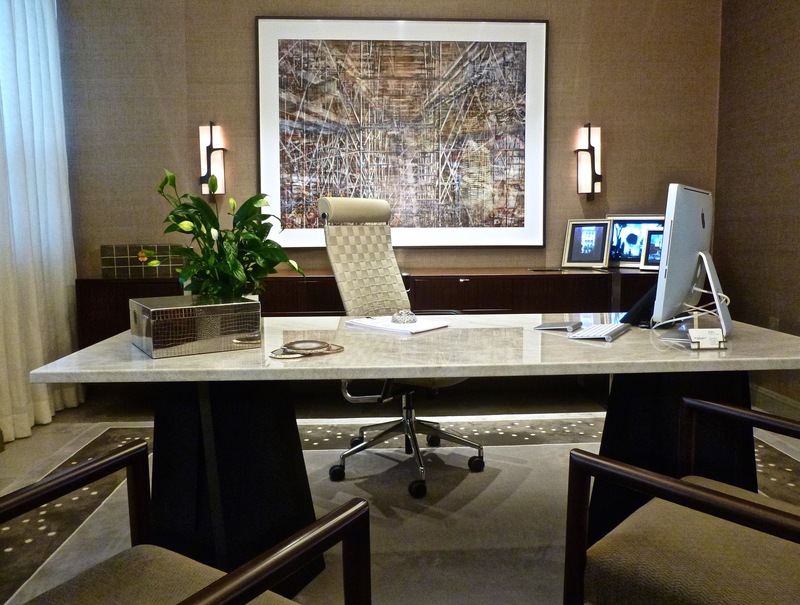 A custom desk was constructed with a Taj Majal Quartzite top and dark angular wood bases. A large patterned silver box holds office supplies. 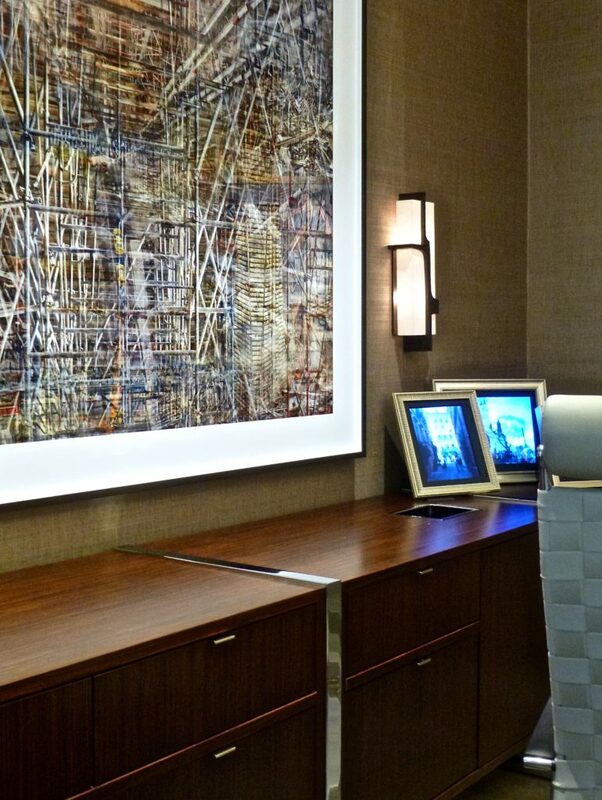 Three electronic photo frames with added custom silver leaf frames sit on the credenza behind for display of both business and personal photos. 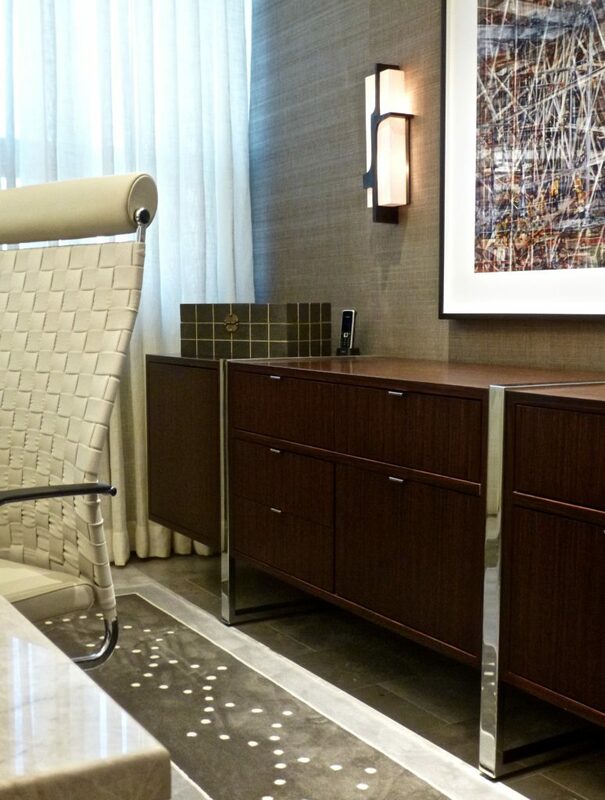 The 12 1/2 ft long rosewood credenza behind the desk is suspended on polished steel supports. It houses a pullout printer, a counter top trash disposal, stationary and file storage. A large shagreen and silver leaf box holds personal items. In a detail of the large Shai Kremer artwork on the wall behind the desk you can see how it is comprised of many images from the rebuilding of the World Trade Center site. The desk looks over a seating area. Guest chairs facing the desk can turn for larger group meetings. 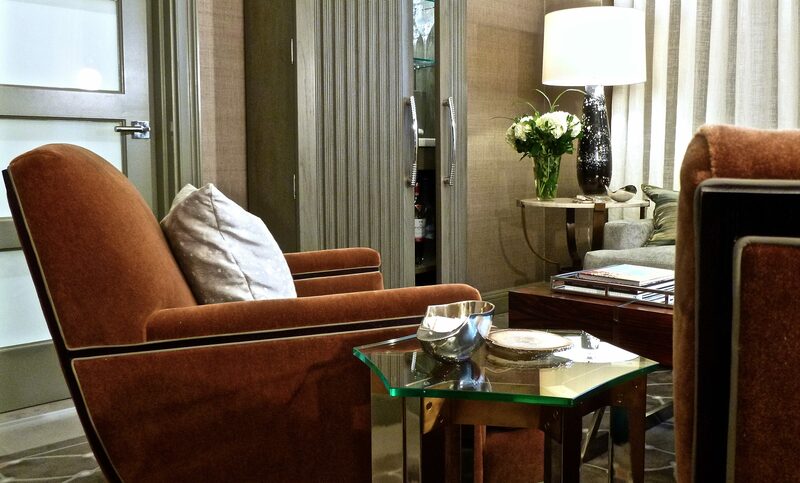 A very large mirror was created to reflect the light of the sheer draped window wall. The two doors leading to reception and a private bath are in deep painted wood with recessed white glass panels allowing light to pass through while assuring privacy. 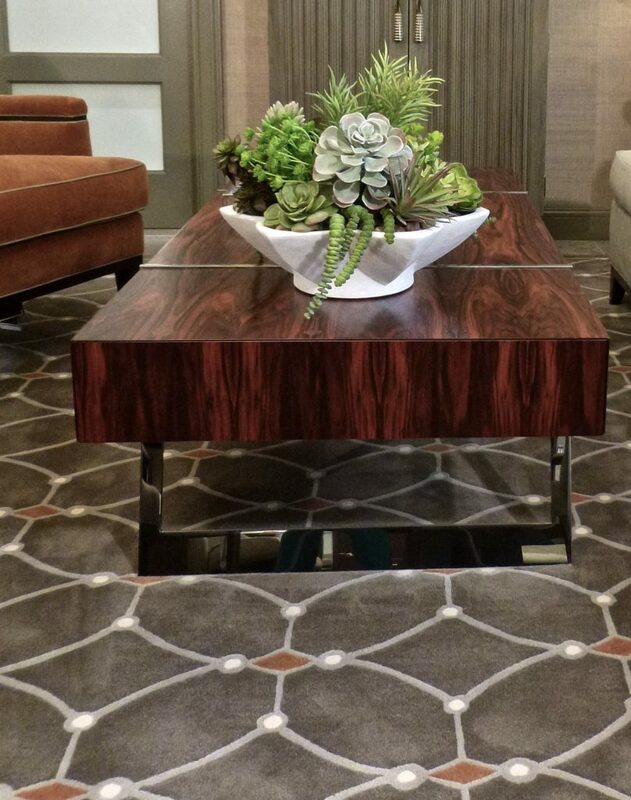 The rosewood coffee table with angled polished steel supports has drawers at each end for storage of working materials. 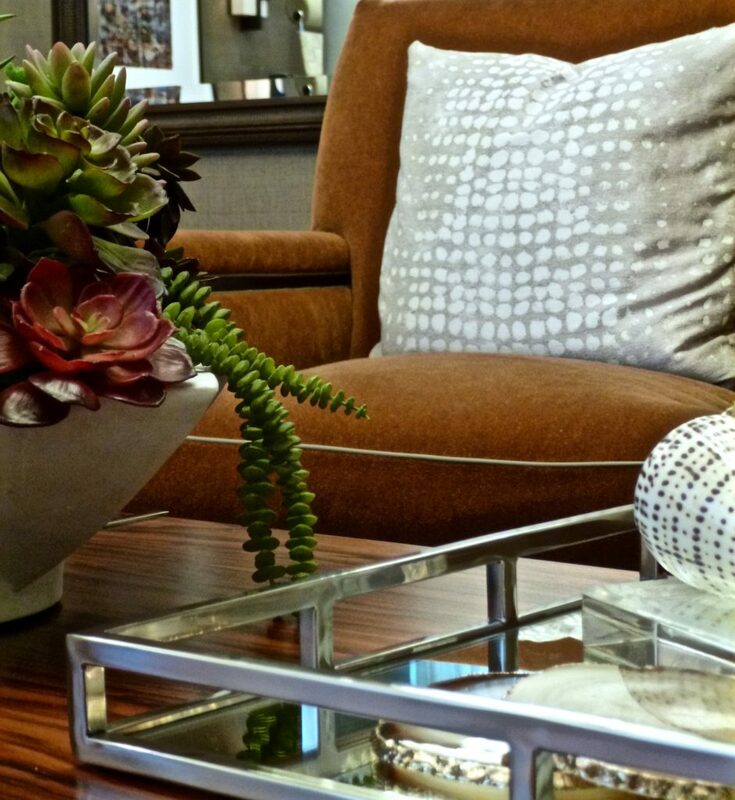 A detail of a corner of the sofa shows the checkered weave in the wool and linen upholstery fabric. 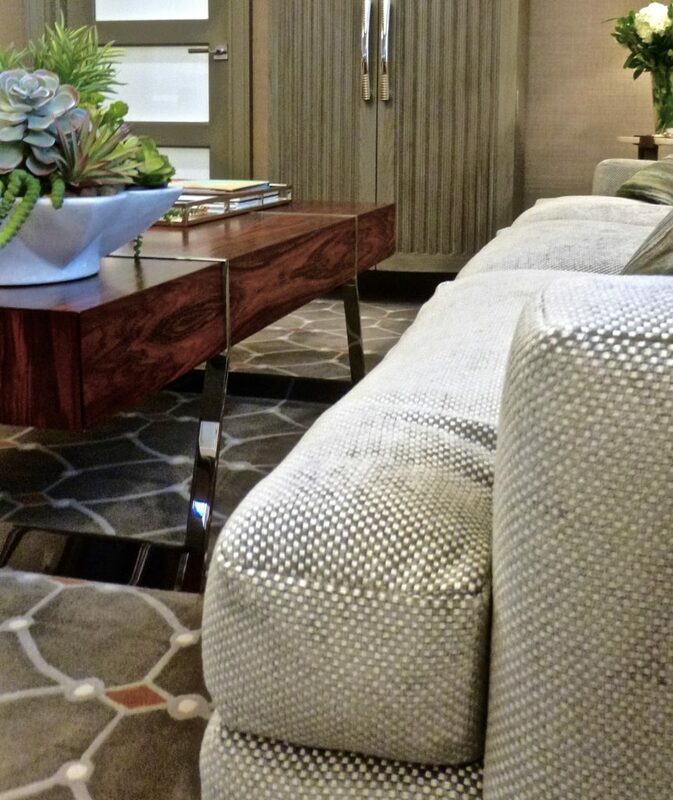 Two lounge chairs are covered in a mohair plush fabric with exposed dark walnut frames and a light grey leather cord detail. 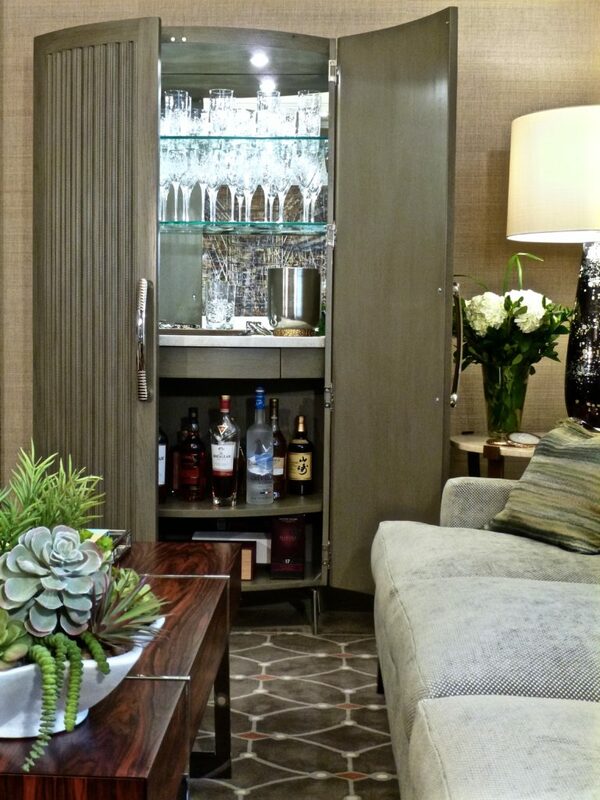 The custom designed bar cabinet is made of grey stained ash with a pressed moulding detail covering the recessed panels of the large curved doors. 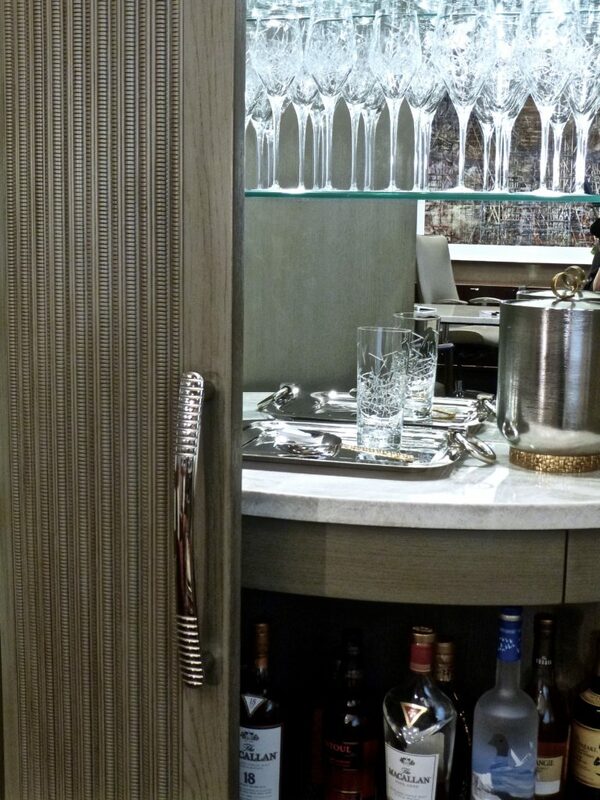 A quartzite counter in the interior of the cabinet functions as an excellent work surface above a utensil drawer and a mirrored back reflects the cut crystal wine glasses. 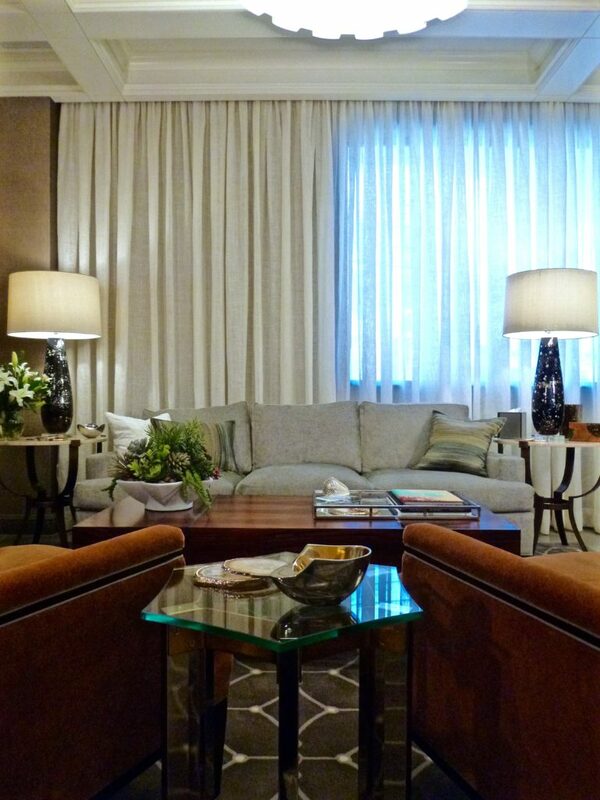 A spring & down three seat couch sits in front of the wall of motorized sheer linen drapery. 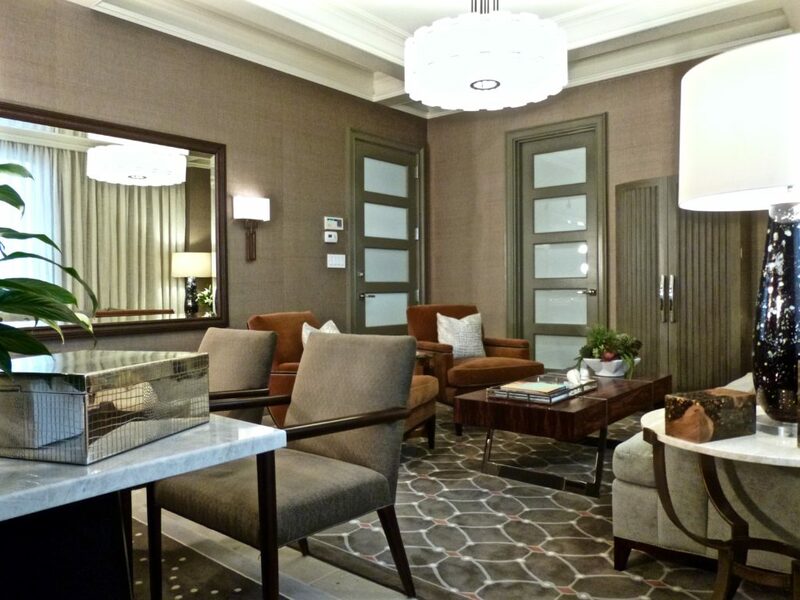 Bronze tables with travertine marble tops flank the sofa. The star shaped side table is made of brass and polished steel with a clear glass top. 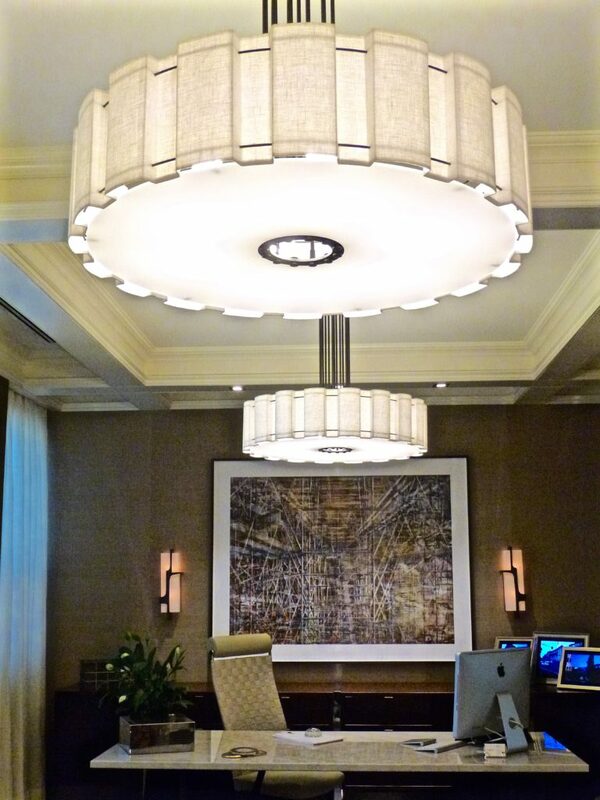 The soft light from the distressed mercury glass table lamps create a intimate atmosphere for high level meetings. 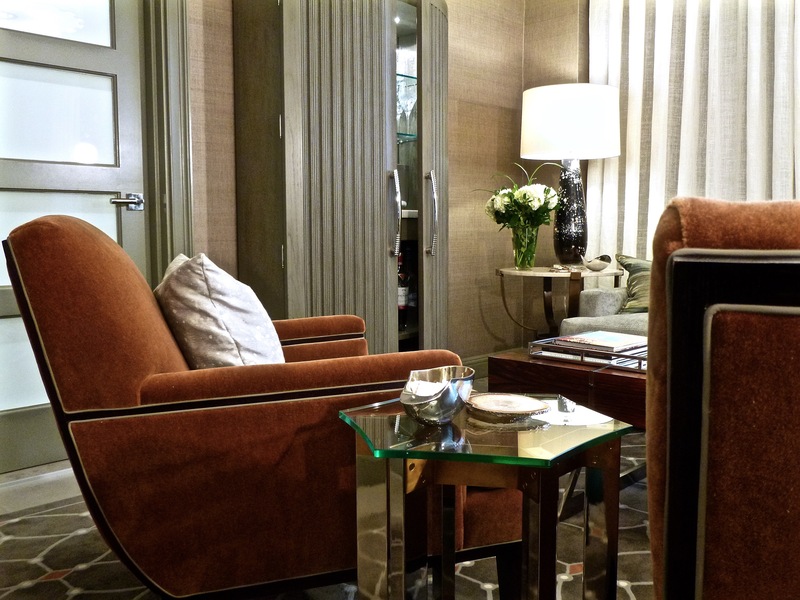 Cream patterned velvet and copper metallic patterned pillows accent the sofa and the mohair lounge chairs hold dot patterned silk pillows. 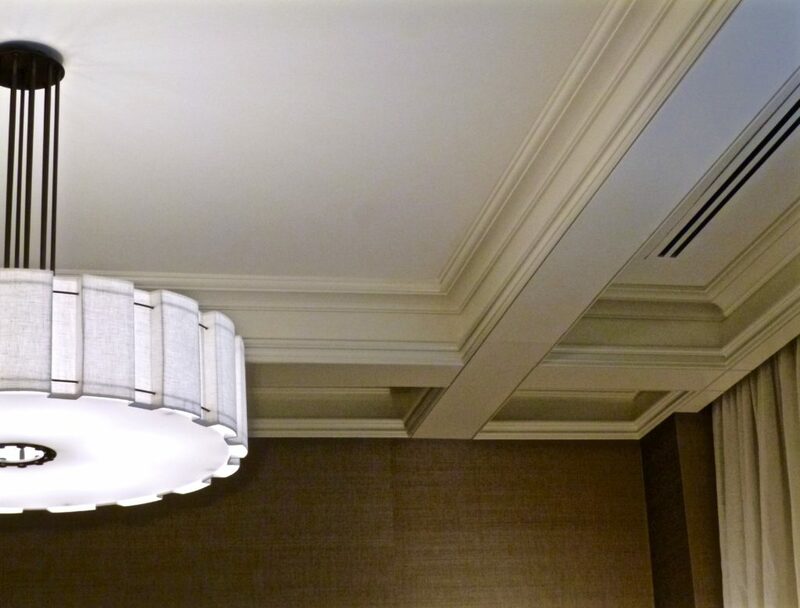 A custom ceiling coffer system was designed to give elegance and detail to the approximately 11 ft high ceilings. The drapery treatment is installed on the ceiling in a pocket behind the coffers. Lineal heating and cooling vents were hidden in coffers along the window wall. The 36″ diameter custom designed bronze and linen ceiling light fixtures are installed at the center of the two largest ceiling coffers. The cross members of the ceiling system hold wall washer spot lights for the picture wall.